The recent episode of Netflix's Our Planet showed some upsetting footage related to the animal ecosystem. Well, it should go without saying that Earth has been devastatingly affected at some aspect of it. The planet has had more than its share of calamities, especially regarding its resources. Climate change has now become somewhat of an overrated theory yet extremely veracious. And time and again, nature hasn’t missed a chance to show its aftereffect. But more than often, some innocent always get caught in its wrath. Walruses around the world are struggling against the mother-nature. Much to the courtesy of Netflix’s Our Planet, we are now seeing some of the most distressing wildlife footage. Sir David Attenborough’s latest documentary is worth the time which is giving the viewers a stunning tour around the globe. Wildlife archive is often expected to be a tragedy and the core of Our Planet was super inevitable to have included those incidents. The reality show is currently focusing more on what’s going on with the polar region. 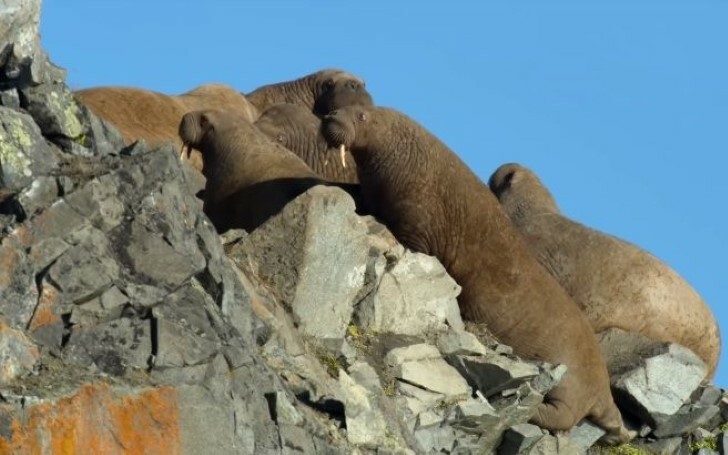 In the recent episode, the tabulated show saw some heartbreaking scenes involving baby flamingos and one with a tragic group of worrying walruses--where they are brawling to reach for the cliff. The seemingly dangerous stunt doesn’t take too long to transition into a disastrous accident. Due to ecological fallout, those poor blubbers were clambering for space atop the ridge and finding themselves worn out. Giving up their last bit of energy, the poor animals were seen plummetting to their deaths in the rocky abyss. Watching walruses accidentally thrash themselves has led to the several Twitterverse’s reactions full of heartache. If you’re planning on watching #OurPlanet, don’t. 2 episodes in and I have spent close on 2 hours blubbering. How do I save all the animals @ourplanet? (Especially the walrus’). The Walrus’ plight comes just after fans have blamed Netflix of shaming Our Planet. As the series journeyed from icy worlds to coastal forests, some regulars were jaw-dropped on the subsequent scenes and still couldn’t believe what they were seeing. Whatever is the reality behind the scenes of Our Planet, the show can’t be accused of its beautiful snapshot of life around the globe. Enhancement in technologies sure makes Our Planet too good to be true. The secret is that the series was made in collaboration with Silverback Films, which is especially known for its high-end nature documentaries. Don't Miss: Sony's New 16K TV Is Bigger Than A Bus!